Visual Studio Code is a popular code editor frequently used for building SharePoint Framework solutions. By setting up debugging of your SharePoint Framework solution in Visual Studio Code, you can more efficiently step through your code and fix errors. 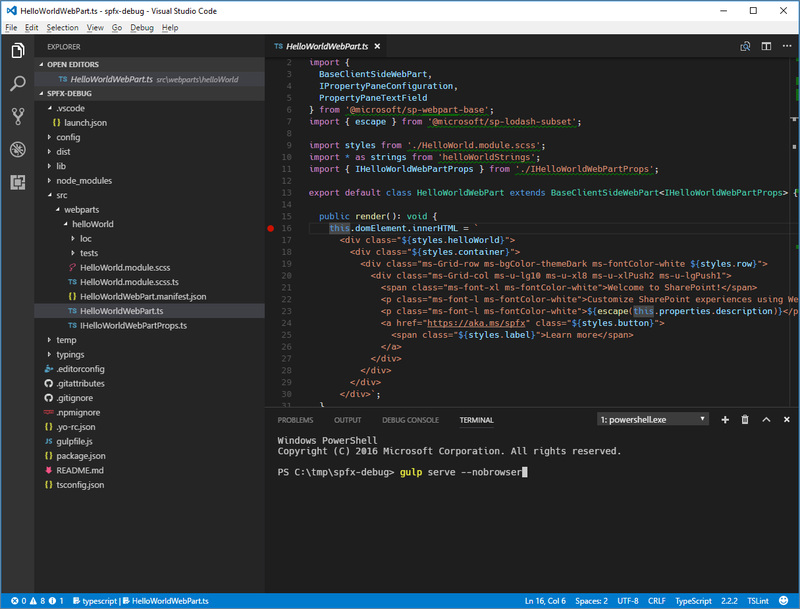 The easiest way to configure Visual Studio Code to debug SharePoint Framework solutions is by using the Debugger for Chrome or Debugger for Edge Visual Studio Code extensions. Starting with the SharePoint Framework Yeoman generator version 1.3.4, the default project (web parts and extensions) templates come set up with the prerequisites and prompt for the required Visual Studio Code extensions to install. In this case, it prompts to install Debugger for Chrome Visual Studio Code extension. You also need the Google Chrome browser. Download and install the latest version of Google Chrome. If you are using a version of SharePoint Framework Yeoman generator that is older than version 1.3.4, you can install the Chrome debugger extension for Visual Studio Code from the Visual Studio Marketplace. In case you want to debug your projects with Microsoft Edge, you need to install the Debugger for Edge extension for Visual Studio Code from the Visual Studio Marketplace and follow the steps in Debugging with Microsoft Edge or older projects. When building SharePoint Framework solutions, you can use the local workbench to verify that your web part is working correctly. Using the local workbench is convenient for testing all scenarios that do not require communicating with SharePoint as well as for offline development. 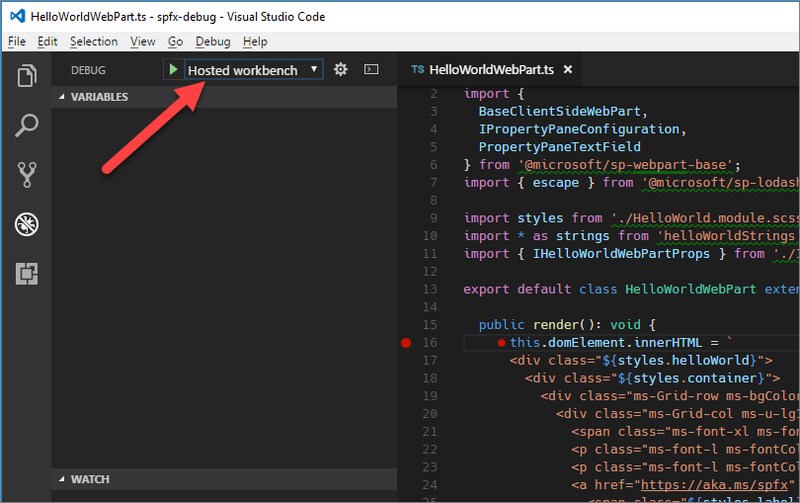 With Visual Studio Code configured for debugging SharePoint Framework solutions by using Google Chrome and the local workbench, you can verify that everything is working as expected. In Visual Studio Code, open the main web part source file, and add a breakpoint in the first line of the render method by either selecting the margin that is left to the line number or by highlighting the code line in the editor and selecting the F9 key. 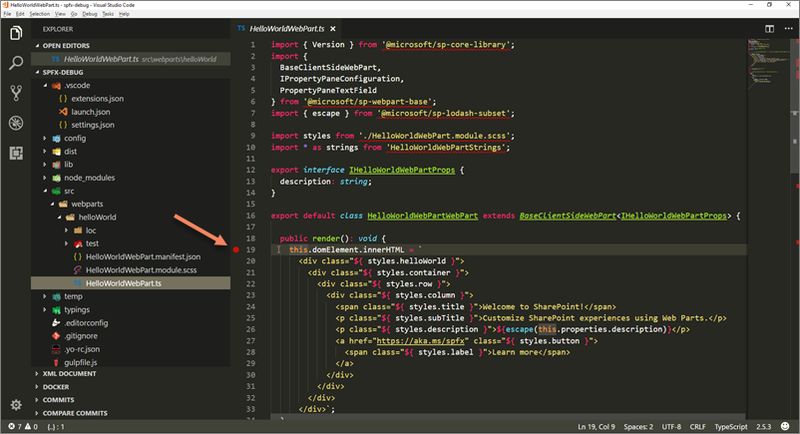 In Visual Studio Code, on the View menu, select the Integrated Terminal option or select Ctrl+` on the keyboard. Running this command builds your SharePoint Framework solution and starts the local webserver to serve the output files. Because the debugger starts its own instance of the browser, you use the --nobrowser argument to prevent the serve task from opening a browser window. 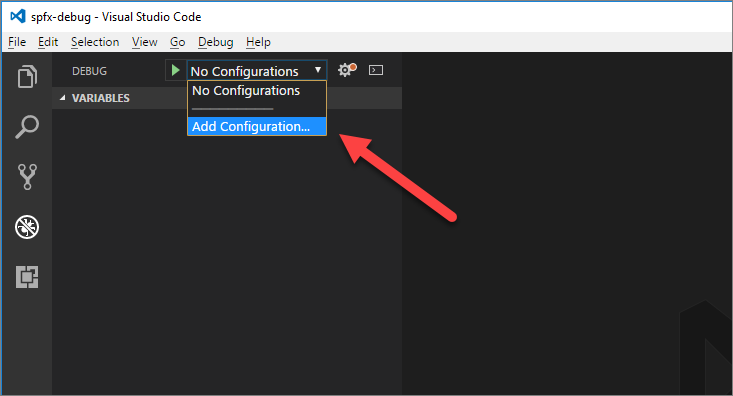 After the gulp task is finished, move the focus to the code area of Visual Studio Code and select F5 (or on the Debug menu, select the Start Debugging option). The debug mode in Visual Studio Code starts, changing the color of the status bar to orange and opening a new window of Google Chrome showing the local version of the SharePoint Workbench. At this point the breakpoint is disabled because the web part's code hasn't been loaded yet. SharePoint Framework loads web parts on demand only after they have been added to the page. To verify that debugging is working, in the workbench, add your web part to the canvas. Notice that with the code loaded on the page, the breakpoint indicator changed to active. 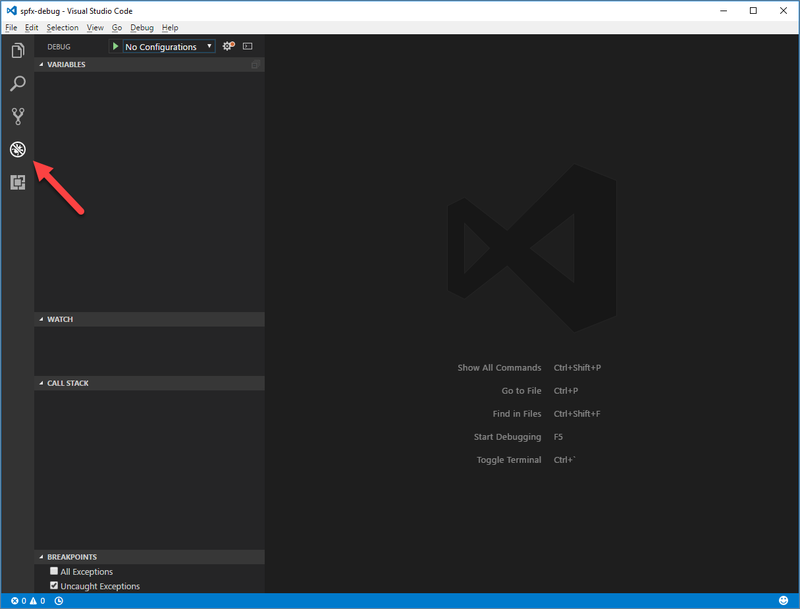 If you now reload the page, your breakpoint in Visual Studio Code is hit, and you are able to inspect all the properties and step through the code. When building SharePoint Framework solutions that communicate with SharePoint, you might want to verify the interaction between your solution in SharePoint. To do this easily, you can use the hosted version of the SharePoint Workbench, which is available on every Office 365 tenant at https://yourtenant.sharepoint.com/_layouts/workbench.aspx. When building SharePoint Framework solutions, you will be doing such tests regularly, and it is a good idea to create a separate debug configuration for the hosted version of the SharePoint Workbench. Open launch.json, and update the url property under the Hosted workbench configuration to your SharePoint site URL. In Visual Studio Code, activate the Debug pane, and in the Configurations list, select the newly added Hosted workbench configuration. Start debugging either by selecting F5 or by selecting the Start Debugging option on the Debug menu. 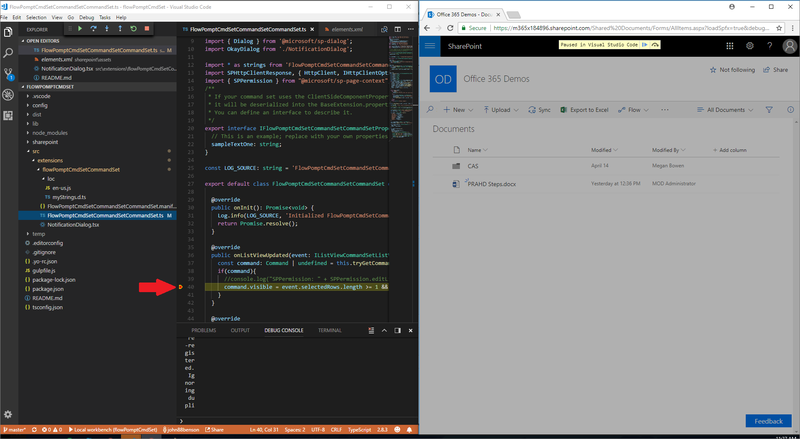 Visual Studio Code switches into debug mode, indicated by the orange status bar, and the Debugger for Chrome extension opens a new instance of Google Chrome with the Office 365 sign-in page. After you sign in, add the web part to the canvas and refresh the workbench, just like you did with the local workbench. You will see the breakpoint in Visual Studio Code be hit, and you are able to inspect variables and step through the code. Debuging an Extension in a hosted workbench is very similar to the steps for a Web Part with a few key differences. After initiating the gulp serve in the Terminal start debugging either by selecting F5 or by selecting the Start Debugging option on the Debug menu. 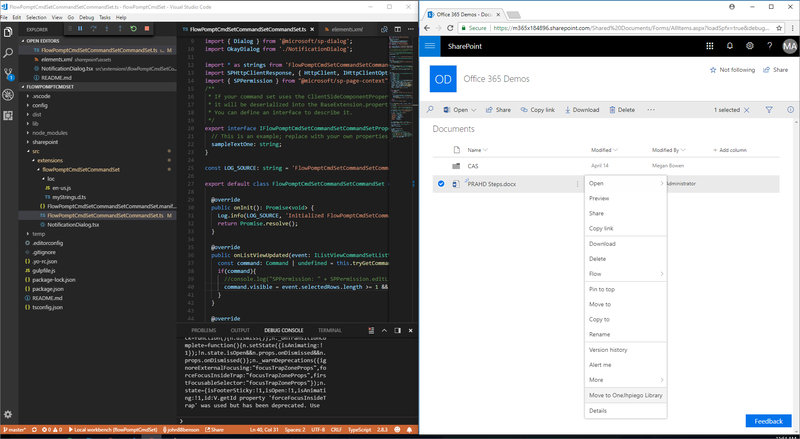 Visual Studio Code switches into debug mode, indicated by the orange status bar, and the Debugger for Chrome extension opens a new instance of Google Chrome with the Office 365 sign-in page. In the workbench tab that was opened in your browser navigate to a SharePoint Online page that you wish to test your extension. Append the following query string parameters to the URL. Notice that you need to update the ID to match your own extension identifier. This is available in the HelloWorldApplicationCustomizer.manifest.json file. loadSPFX=true. Ensures that the SharePoint Framework is loaded on the page. For performance reasons, the framework does not load unless at least one extension is registered. Because no components are registered, you must explicitly load the framework. debugManifestsFile. Specifies that you want to load SPFx components that are locally served. The loader only looks for components in the app catalog (for your deployed solution) and the SharePoint manifest server (for the system libraries). customActions. Simulates a custom action. When you deploy and register this component in a site, you'll create this CustomAction object and describe all the different properties you can set on it. Key. Use the GUID of the extension as the key to associate with the custom action. This has to match the ID value of your extension, which is available in the extension manifest.json file. Location. The type of custom action. Use ClientSideExtension.ApplicationCustomizer for the Application Customizer extension. Properties. An optional JSON object that contains properties that are available via the this.properties member. In this HelloWorld example, it defined a testMessage property. Select Load debug scripts to continue loading scripts from your local host. If you are using an older version of SharePoint Framework Yeoman generator or want to debug with Microsoft Edge, follow these steps to create the launch.json file manually. In order for you to debug with Microsoft Edge, you will have to install the Windows 10 April 2018 Update which includes the Microsoft Edge DevTools Protocol. In Visual Studio Code, activate the Debug pane. In the top section of the pane, open the Configurations list, and select the Add Configuration option. In the list of debug environments, select Edge or Chrome. In Visual Studio Code, open the ./.vscode/launch.json file.